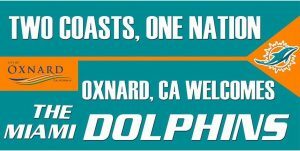 OXNARD, Calif. – Due to Hurricane Irma, the Miami Dolphins have temporary relocated their football operations for the upcoming week from South Florida to Oxnard, California. Hurricane Irma, a Category 4 storm, has caused catastrophic damage across the Caribbean and made landfall in Florida this weekend. Florida has declared a state of emergency and issued mandatory evacuations across the state. As a reminder, there will be no public access to the training facility during the duration of their stay. We appreciate the public’s cooperation in an effort to provide the Miami Dolphin’s with a private training environment as they prepare for their upcoming game. For more information contact Melissa Valdez, Community Affairs Manager, at melissa.valdez@oxnardpd.org or (805) 342-8292.